I routinely uses a wide range of social media tools and technologies to connect with the community and disseminate education technology innovation and practice. For the past ten years I have made extensive use of social media tools and technologies to facilitate my work as an education technologist. Over this period I have built up a suite of tools that form my online working environment. Some of the main tools I use are as follows. 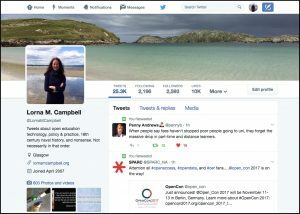 Open World lornamcampbell.org – my personal blog which I use to reflect on my professional practice. This blog also acts as my eportfolio with links to my CV, publications, presentations and other relevant information. WordPress running on Reclaim Hosting. 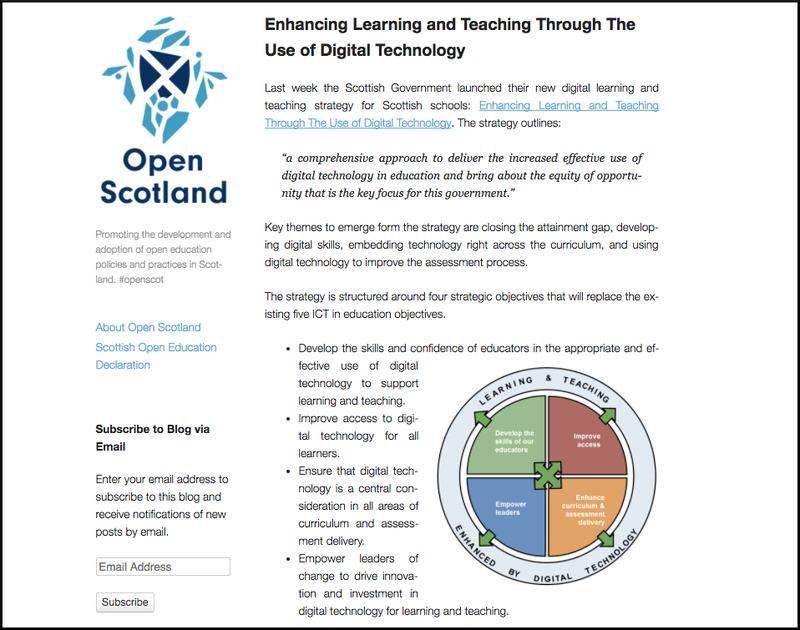 Open Scotland openscot.net – acts as a focal point to engage the community and disseminate news and developments relating to all aspects of openness in education in Scotland and further afield. WordPress running on Reclaim Hosting. 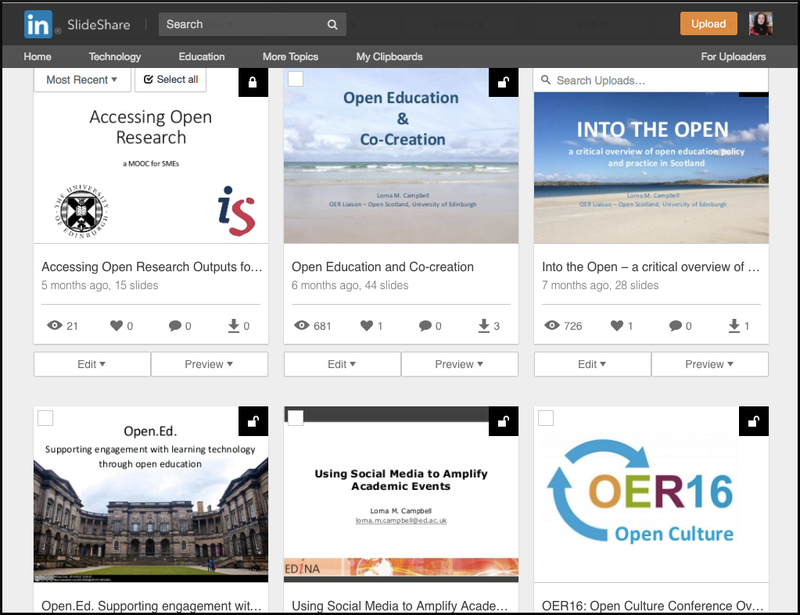 University of Edinburgh Open Knowledge Network okn.ed.ac.uk – promotes the events and activities of UoE OKN, an informal forum that draws together the University’s strategic policies and activities in the area of Open Data, Open Access, Open Education, Open Research, Open Collections and Archives, in order to support cross-fertilisation and promote the institution’s activities in these areas. WordPress running on University of Edinburgh servers. 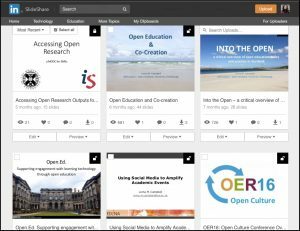 I also write occasional posts for other blogs including Wikimedia UK , #ALTC  and the Open Education Working Group . I have maintained a twitter account since 2009. In addition to my blog Open World this is my main channel for disseminating practise and connecting with the community. I use twitter to engage in conversations with colleagues, publicise my own blog posts, reflect on practise, and retweet items of interest. In addition I regularly livetweet a wide range of conferences and events, using hashtags to disseminate and collate information I have been invited to provide social media coverage for a number of high profile events including the ALT Conference  and the Digital Day of Ideas  at the University of Edinburgh. I use Storify to create curated social media archives of events I have attended, selecting tweets, images and links to create a coherent narrative of these events. I have a Slideshare account that I use to share my own powerpoint slides, and speakers’ slides from events I have run and facilitated. All presentations are appropriately described and tagged and the majority of my own slides are Creative Commons Attribution (CC BY) licensed. I use Skype for one to one conversations with colleagues while working remotely, for project management calls with small groups and for transferring documents and images. I find hangouts tend to be more reliable that Skype for facilitating video conversations with slightly larger groups. The maximum number of people who can actively participate in a video hangout is ten which is an obvious limiting factor, though a much larger number can listen in. Hangouts can also be streamed directly on to Youtube which makes them a useful broadcasting tool. I tend to find hangouts are useful for project meetings, small committees, broadcast interviews such as the ALT Community Call below, and Virtually Connecting sessions . 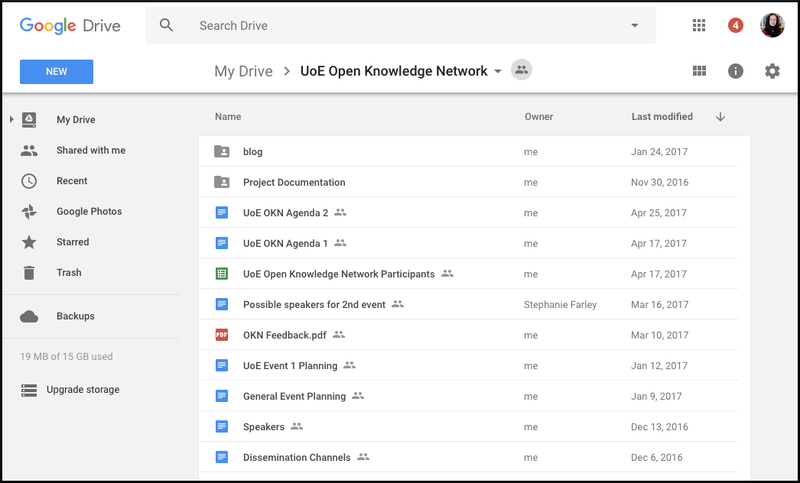 Google Drive is one of the most valuable tools I use for creating, sharing and managing documents. (The other is DropBox.) 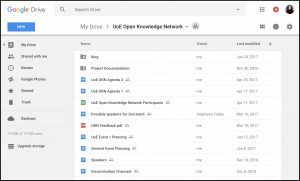 I frequently use Google Drive as a cloud storage space to enable me to access documents from multiple devices, however its real value for me is in facilitating collaborative working and document authoring. I have routinely used Google Docs and Google Sheets collaborative functionality to author project reports, draft funding bids, write papers, chapters and books, manage projects and finances, peer review papers, and organise conferences and events. The ability to suggest edits and add comments while retaining a fine grained revision history is invaluable for collaborative working. In addition to the social media expertise outlined here I also have extensive experience of authoring learning technology interoperability standards and controlled vocabularies. See Core area 3a and Core area 3b for discussion and reflection on some of the standards and controlled vocabularies I have been involved in developing. 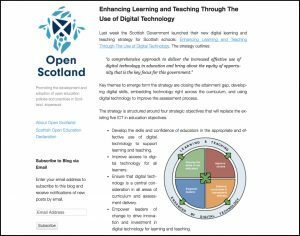 It’s no exaggeration to say that my use of social media technology has been fundamental to shaping my personal and professional identity as an open practitioner and as a learning technologist. Communication and dissemination has always been a critically important part of my role, and as someone who frequently works remotely and with distributed teams scattered across the institution, the country, the world, social media provides me with an invaluable channel to talk to colleagues, reflect on my practice, seek feedback from my peers, and participate and engage with the global connected open education community. My use of Twitter and WordPress blogs is so fundamental to the way I work that I genuinely don’t think I could do my job effectively without access to these tools. Twitter in particular is my workspace, my office, engage with my peers and connect to colleagues all over the world. It’s where I pick up news, find new ideas, and listen to fresh perspectives. It’s where continuous professional development happens and where I learn. Twitter is also an invaluable tool for communicating and disseminating educational events all kinds of and it’s become second nature for me to live tweet every event I attend. I find that live tweeting helps me to process what I’m listening to and the 140 character limit means I have to synthesise the ideas as I go along. Live tweeting in an official capacity for events such as the ALT Conference  requires a slightly different approach to live tweeting from my own personal account. When I live tweet on behalf of an event organiser I try to keep my tweets as factual, neutral and representative as possible. It’s important not to misrepresent the speaker or inadvertently tweet anything that might bring the organisation into disrepute. If I’m tweeting personally, I tend to tweet the points that interest or irritate me, adding my own thoughts and comments along the way. It feels like quite a different way to use the technology. 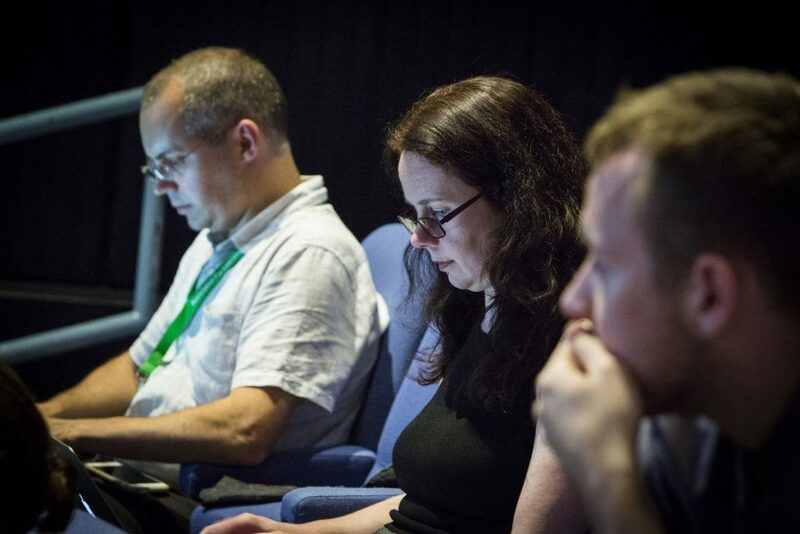 Me and Rich Goodman livetweeting at ALTC. Despite the fact that twitter is such an important channel for me, I actually use very few Twitter tools. I have tweetbot installed for occasions when I want to manage multiple accounts but I prefer to use the generic web interface. I have several lists set up, but I very rarely use them, I prefer not to filter as I particularly appreciate the random serendipity of my Twitter feed. The only twitter tools I use with any regularity are Storify, for collating event tweets, and TAGs for archiving and visualising tweets associated with event hashtags. Although the suite of tools I use meets my current requirements, I still make an effort to explore new social media technologies as they emerge, so that I can have an informed opinion on new technology developments and how they may or may not be applicable for teaching and learning in general and my own personal practice in particular. Another important aspect of my social media use is that it allows me to maintain my professional profile and portfolio when my role changes. 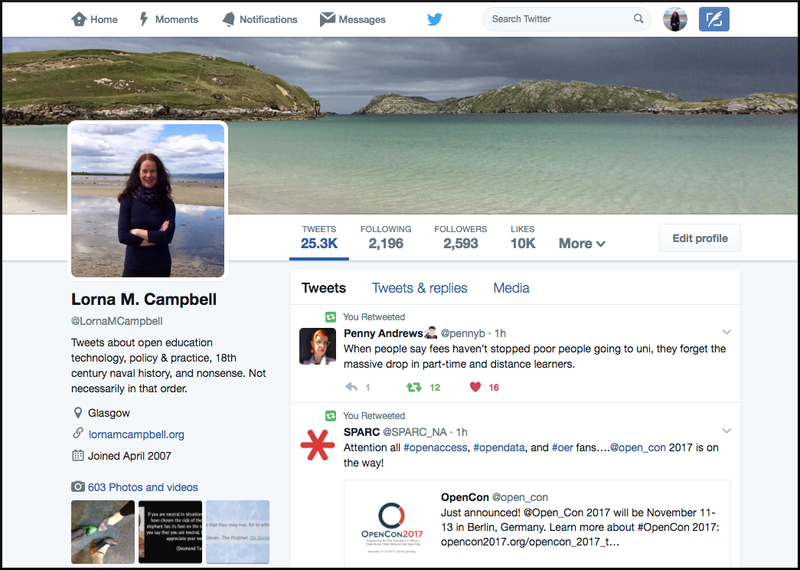 As someone who has worked for much of their academic career on multiple project and short term contracts I have found it useful to curate a professional profile outwith the bounds of the institution. Maintaining and managing my own social media channels provides some continuity and avoids the disruption that can be caused by contracts ending and having to migrate from one role or institution to another, with all the technology interoperability issues that this can entail. In order to ensure I have greater control over my personal blog Open World I recently transferred my blog from WordPress.com to Reclaim Hosting, the service that provides domains and web hosting for students and educators. Running my blog on Reclaim Hosting enables me to manage and retain control over my professional online portfolio and identity. Email from Dr Anouk Lang, organiser of the Digital Day of Ideas, thanking me for live tweeting the event. Thank you both very much for coming to the Digital Day and giving participants the benefits of your expertise on academic social media in a workshop. I talked to many people who, though they were clearly apprehensive about starting their own blogging/tweeting lives, now felt like they were in a much better position to begin doing so. I’m also deeply grateful to you for generating the digital record of the day with your own blogging and tweeting – I can’t do much more than amplify other people’s interesting thoughts while I’m at a conference, and I continue to be amazed at your ability to capture things in depth in real-time! We’ll put links to those up on the digital.hss.ed.ac.uk website, but it may take a week or so as there’s a lot of mopping up to do, so forgive me if we’re not as lightning-fast as the two of you!